Aiken's Lodge in Kanab, Utah is your PERFECT home base! Enjoy an outdoor lovers paradise! Our rooms are clean, comfortable, and affordable. Aiken's Lodge is the perfect location to visit Zion, Bryce and the North Rim of the Grand Canyon National Parks as well as Best Friends Animal Sanctuary, Coral Pink Sand Dunes, Pipe Spring and Lake Powell Recreation Area. Located in the downtown historic district in Kanab, Utah it is within walking distance to many local shops and restaurants. This family owned motel is known for its comfort, cleanliness, quiet location and reasonable rates. There are several types of rooms to accommodate our guests, whether it's one, two or three beds to make you and your families comfortable. Parking outside your rooms make for easy access to vehicles. Enjoy Kanab's evening air in chairs located outside each room, relax in our seasonal outside pool, catch up on your internet email, do your laundry and enjoy local dining choices or see a movie. All rooms are non-smoking with fridges, hair dryers, comfortable beds and complimentary wireless internet access. Start your morning with our continental breakfast available in our office from 7-10 am. Get our LOWEST RATES when you book online! Check availability and book online from this website to receive our absolute BEST RATES! Utah’s southwest is a land full of breathtaking vistas and striking formations, and you’d be hard pressed to find a better place to explore it from than Kane County. With national parks and recreation areas in every direction, lovers of the outdoors could spend weeks in this area without exhausting the possibilities for hiking, scenic drives, camping, or mountain biking. For starters, there’s the sprawling Grand Staircase of the Escalante National Monument, an enormous area of sandstone cliffs, rugged plateaus, and winding unpaved roads. Head a little farther east and you’ll come to Lake Powell, whose scenic finger canyons are loved by boaters and anglers. 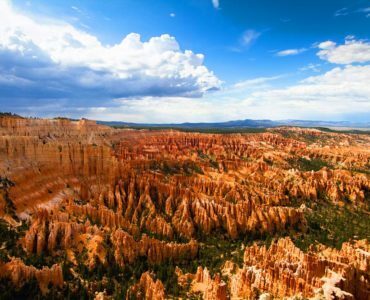 Travel south and you’ll come to the North Rim of the Grand Canyon; on the west is the noble grandeur of Zion National Park; to the north you’ll discover the arches of Bryce Canyon and the sharp spires of Cedar Breaks. Everywhere you look, there’s something new to see. You might expect crowds and traffic to go with all this scenery, but most of this area receives little visitation and maintains an ageless solitude. Sleepy little towns like Alton and Mount Carmel Junction fit in unassuming niches in the landscape, while the city of Kanab has full services, art galleries, and annual Western-themed events. Great little place in the heart of Kanab! Skip the chains and stay here! -- "We stayed here for two nights, as part of a horseback riding trip - the Red Rock Ride. I am SO glad they didn't just stick us in one of the chain hotels out on the edge of town! Aikens Lodge is right on the main drag, within walking distance of restaurants and shops. Our room was very clean and we loved the funky atmosphere! It was so nice to be able to walk around downtown in Kanab, a truly lovely town! There's a very nice outdoor pool - we didn't swim, but others in our group did and said it was clean and very nice. There are chairs to sit in outside your room so you can watch the small town goings-on. Don't miss this place - it's a gem!!!" Perfect for our needs -- "We've traveled extensively staying in budget type accommodations and this was one of the best. Stayed 3 nights while exploring the area. Staff was friendly and helpful. Room was good size and clean. Continental type breakfast breads and fresh fruit in the AM." Nice family atmosphere -- "We were able to secure a 24-hr in advance reservation here the first time we came through Kanab. It's a pretty large place, but they fill up because of their nice atmosphere and the popularity of the area. Room was nice sized, clean, comfortable bed. Very nice and helpful front desk. Below, I've indicated this to be a mid-range in price. However, due to the popularity of the area, many places are more expensive than this one. It likely can fill the bill for a budget-range motel." Whether you’re traveling solo or bringing the whole gang, Aiken’s Lodge has a room that fits your needs at a price that can’t be beat. Surrounded by numerous attractions easily within driving distance, this is the perfect place to serve as base camp for your next excursion. Please review below to see the different room options available to you for your stay with us at the AIken’s Lodge in Kanab, Utah.